It’s important to keep your wiring routed and secured away from moving parts, high heat and from abrasion. Painless offers two simple solutions with our PowerBraid and new ClassicBraid. 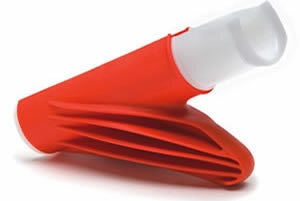 The durable material is lightweight and extremely flexible. Not only is it ideal for the aesthetics of your project, but it adds protection against abrasion and heat (up to 257F). They also have a resistance to the majority of chemicals and automotive fluids. The lateral split down the loom has a minimum edge overlap of 25% material for a secure fit around wires without extra tape or tie-wraps. 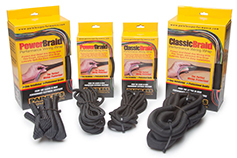 Not only are the PowerBraid & ClassicBraid great for wires, but it also can be used around hoses, lines and other items throughout a build. Available options in sizes from 1/8’’ to 2’’ in various lengths, including complete kits for chassis or EFI wiring. They are also available in chassis and fuel injection kits containing everything you will need to cover your harness. 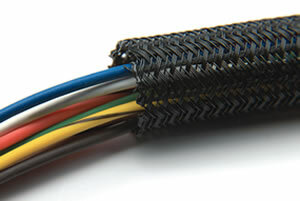 The woven construction provides good drainage while maintaining superior abrasion resistance. 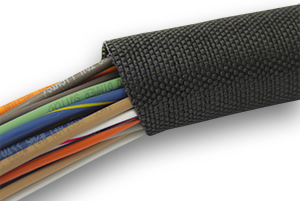 Laterally split with a minimum 25% overlap to allow for easy installation and optimum wiring protection. The Easy Install Tools will get the job done quick and easy.